A collection of tiny water drops seen in the air. Water that falls to the ground from the atmosphere. Layers of gases and dust that surrounds Earth. The measurement of how hot or how cold something is. Choose the correct order of events in the water cycle. What is the correct sequence for the following water cycle steps? Rainfall (precipitation) is measured in? Which of these is NOT an example of precipitation? ___________________________________ is any form of water that falls from clouds. Snow is a type of precipitation. Which is an example of precipitation? Which is a form of precipitation? Which of these is a form of precipitation? Which letters below correctly identify precipitation and evaporation? D is precipitation and H is evaporation. C is precipitation and K is evaporation. B is precipitation and I is evaporation. G is precipitation and E is evaporation. Which of the following describes the steps of the Water Cycle in the correct order? 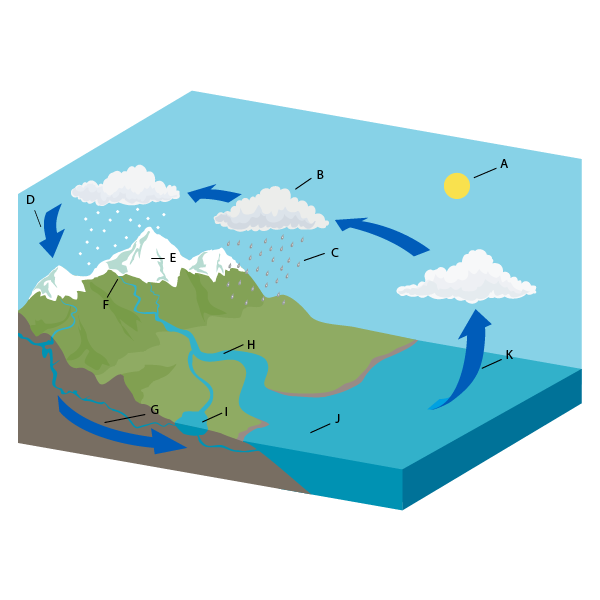 The diagram represents processes in the water cycle. Which letters below correctly identify precipitation and evaporation as shown on the diagram? Which of the following in NOT a type of precipitation? What measures the amount of precipitation? What are the common types of precipitation? The most common form of precipitation is . Which word better fits the sentence? Rain and snow are two types of . is water that falls to Earth's surface as rain, sleet, or snow.